A Closer Look at the WideOrbit – TubeMogul Alliance - WideOrbit Inc.
As I’m sure you’re aware, the demand for programmatically traded advertising is growing quickly. 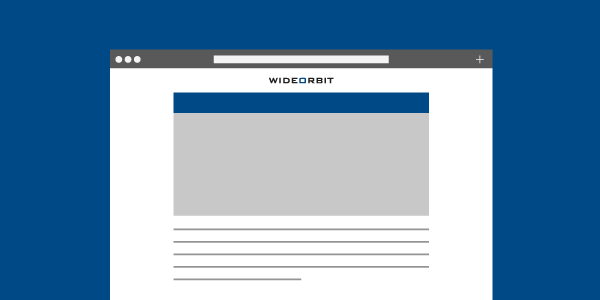 Programmatic TV is a key initiative for WideOrbit and we have made a lot of progress. This week was both a culmination of years of work and also a new beginning. WideOrbit launched WO Programmatic last month to highlight our combined programmatic offering for linear and digital. WO Programmatic is comprised of two major products, WO Programmatic – TV and WO Programmatic – Digital (which is essentially the US launch of our recent acquisition AdMeta). The ability to offer both digital and linear solutions – which we anticipate will solve major pain points for broadcasters and networks as their businesses evolve – differentiates us from every other company in the ad tech industry. One of the key problems in launching any innovative product is the proverbial ‘Chicken & Egg’: it’s built on anticipated demand, but customers won’t buy until their convinced it’s ‘real’ and works. In the case of WO Programmatic – TV, we needed commitments from advertisers to convince sellers to release inventory. Sellers – historically and with good reason – prefer to know advertisers will spend with them before they allocate inventory. That’s a really challenging paradigm. To solve this challenge, we partnered with one of the largest buyers of digital video advertising on the planet – TubeMogul. Just as WideOrbit only represents sellers in media transactions, TubeMogul only represents buyers. This made them natural partners to jumpstart the market. We are already airing spots purchased through the Programmatic – TV-TubeMogul partnership from major advertisers like 3M and Allstate and media agencies like Digitas and Levelwing, among many others. To viewers, these spots may look like your usual 30-second national TV ads. For WideOrbit, it’s the culmination of years of hard work, problem solving and commitment to strong client relationships. This progress is only possible due to many years of work and effort that WideOrbit has put into winning the trust of our clients at broadcasters and cable networks. In particular, a huge thank you is due to early adopters like The E.W. Scripps Company, Raycom Media, and others. We are actively fine-tuning and expanding our platform, and more details will follow in the New Year. There is an incredible opportunity here for advertisers, broadcasters and networks, and we hope you’ll join us on the journey.